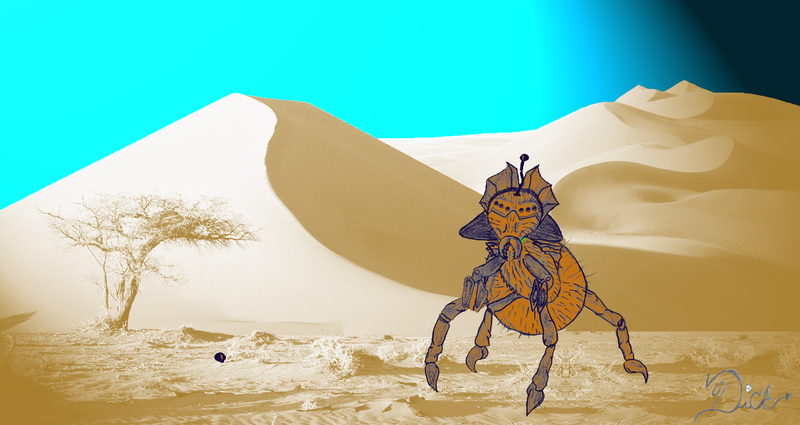 In Ciliantar, the Tympanasiring bury their large bodies beneath the sand, leaving a single antenna above. The antenna detects a meal or danger as it approaches, which prompts the attack. Large sacks of venom located in the back of the Tympanasiring’s mouth project an acid that quickly paralyzes the victim alive as the Tympanasiring’s young surface to devour the flesh. Few have escaped an encounter with a Tympanasiring, but those who have survived carry deep scars of the acid burns. Because the Tympanasiring require very little food or water, they can remain dormant for at least two mooncycles. Each has six legs, a hulky body, and an elongated head. They have been known to grow taller than humans. Six eyes, three on either side of the head, can move independently at the beast’s will, leaving little room for a sneak attack. Its senses are heightened thanks to an attentive antenna located in the center of its head. Tiny hairs protect the hard shell-like skin from drying and cracking in the hot desert terrain. The front two legs have small claws that help the creatures bury themselves deeply and quickly in the sand. The Tympanasiring are vicious creatures that have been known to devour each other when there is a lack of food. After mating, the mother lays one egg sac that can produce at least thirty offspring and in some cases, fifty. The mother finds a cool, dry place, tunneled and protected, in the sand to hide her egg. After five mooncycles, fully developed Tympanasiring emerge from the sand in search of food. Some younglings begin to eat their siblings during this journey to the surface. The young require sustenance at least twice per mooncycle for the first three to four cycles of their lives. They learn to nest and hunt from their mothers and usually eat the fathers to survive. After reaching maturity, Tympanasiring normally live in solitude unless they are ready to mate.